The last few days have been fairly humbling for John. It seems that his back has become inflammed next to the subaceous cyst that was removed 18 months ago. We hope that it is unrelated but we can’t be sure. 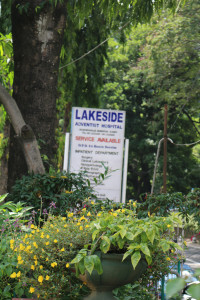 He got antibiotics in Colombo, however, since it didn’t get any better, he had to go a hospital in Kandy. The staff were brilliant and Doctor Jayakumar has drained John’s back and we hope that, once it has healed and the antibiotics have finished their course, John will be back to normal. Although this may be something that needs looking into later. To make matters worse the strong antibiotics do terrible things to John’s digestive system. So he is feeling pretty sorry himself at the moment. Sorry for all the gory details – just wanted to be honest about what is going on. Please don’t worry though. We are fine and being well looked after. All of this causes us to reflect upon all the people we have met so far. In the last week many people have asked John to pray for healing, which he has been happy to do so. Yet, despite prayer, here he lies in bed. Yet another learning experience. Many of those who come asking for healing cannot afford professional medical treatment like we can. Still the Lord has provided as graciously as ever. The hospital staff dealt with us so quickly and so kindly. Ramanan has found an amazing hotel (at special Ramanan rates!?) and so the girls are very happy about taking it easy today. They have gone off to the elephant sanctuary this morning and I’ll go back to bed once I’ve written this. John.